This publication summarizes the benefits of gardening with children and provide information about basic garden preparation, tools and resources for parents/adults. 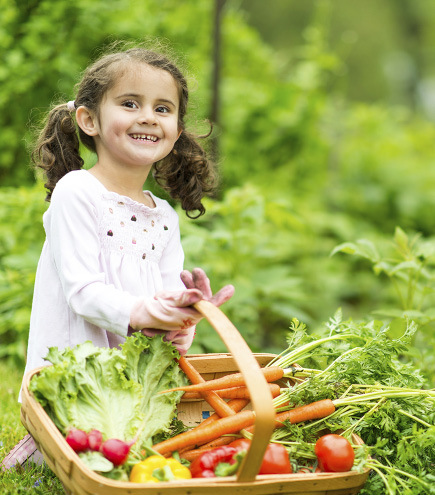 How do children benefit from gardening? Get your child interested by helping you design the garden, and plant, water and harvest the fruits of their labor. Children enjoy opportunities to learn through hands-on activities and stories. 1 Test soil fertility (contact county Extension office for information). Till soil if needed. 2 Select seeds or transplants. Some plants are annuals, biennials or perennials. Knowing what season they are grown and harvested in affects the short- and long-term plan for the garden. 3 Determine the planting layout in the garden. Different layouts are suitable for different plants. Some examples are: furrow, square foot or hill planting. Also, some plants require trellises or cages to support growth. Most plants are best planted in May. • The first 2½ weeks in May are best for leafy greens (such as lettuce, chard, spinach) and beets, carrots and potatoes. • The last weeks in May are best for beans, squash, pumpkins, cucumbers and tomatoes. • Consult the seed packet, or a garden center or plant nursery for additional planting information on specific plants. Community Garden – If you don’t have a personal garden area on your property, you may be able to enjoy a garden plot in a community garden. Containers – Using containers or pots may be a good option if you have limited space or access to community gardens. Compost – If you have a garden on your property, building and maintaining a compost pile or box is a great way to use organic materials to enrich your plant soil. Compost requires soil and raw organic matter, such as leaves, grass clippings, and vegetable and fruit peelings. Books will excite and educate children about gardening. Brown hamburger and onion in saucepan over medium heat. Blanch fresh tomatoes by removing stems and scoring bottom of tomato; boil one minute, immediately place in cold water, remove skins. Add remaining ingredients, bring to a boil; reduce heat and simmer for 30 minutes. Makes eight servings. Each serving has 170 calories, 22 grams (g) carbohydrate, 3 g fat, 1 g saturated fat, 14 g protein, 6 g fiber and 460 milligrams sodium. Children enjoy eating their freshly grown fruit and vegetables. All garden produce should be washed with plenty of cold water before you eat it. You can store washed and drained produce in airtight containers in the refrigerator to keep them fresh and ready to eat for healthful snacks. Tomatoes, onions, potatoes and winter squash should not be stored in the refrigerator; instead they should be stored in a cool, dark place. Can fruits and vegetables in sterilized jars with proper canning equipment, using current guidelines. Canned produce should be used within one year and stored in a dark, dry place between 50 and 70 F for best quality. Dehydrate fruits and vegetables in a dehydrator and store them in a cool, dark, dry place. Fruit can be stored for about six months at 80 F or one year at 60 F.
Freeze fruits and vegetables as soon as possible after harvesting them. Blanch vegetables (boil vegetables, followed immediately by cooling them in ice water) before freezing for best quality. Boiling time varies by vegetable type. Produce freezer life varies. Produce can last eight to 12 months at 0 F.
A variety of detailed information on preparation, planting, maintaining and harvesting your garden, along with preserving and storing produce, can be found at your local NDSU Extension Service office or by visiting www.ag.ndsu.edu. Horticulture (NDSU Extension Service): Includes information about growing fruits, vegetables and other plants. This publication was authored by Desiree Tande and Ron Smith, former NDSU Extension specialists, and Nadia Anfinson, former undergraduate research assistant.